Generally, I’m not a salad person (meaning a person who enjoys salad, not a person made of salad, though I’m not that either). But somehow, a Caesar salad is different. It’s probably the only kind of salad I have ever ordered at a restaurant – the tangy, creamy Caesar dressing, crispy croutons and shavings of parmesan cheese make it feel very un-salad-like (can anything topped with bread and cheese really be called a salad?). There’s no denying that a Caesar salad is something a bit special. Unfortunately, I don’t get to enjoy it very often, since restaurant versions are often not veggie-friendly – anchovies in the dressing (or even added on top), real parmesan as opposed to the vegetarian equivalent… so I decided to make my own! This is the ultimate vegetarian Caesar salad. 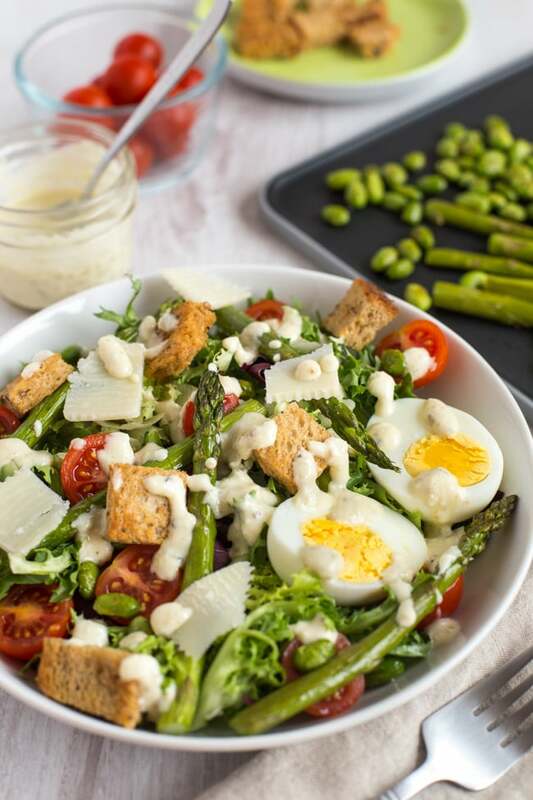 Homemade Caesar dressing, and all the usual Caesar salad elements – plus a few of my own additions to turn a simple salad into an exciting full meal. First up, the lettuce. A Caesar salad is usually made with romaine lettuce, but since I was going for perfection here, I used a bag of mixed lettuces – we’re going for an ‘every bite is different’ kind of dinner here. I used Florette‘s ‘Mixed’ bag, which contains all kinds of varieties – escarole, frisée, green batavia, green cos, iceberg, radicchio… you get the picture. Lots of lettuce. You want to use a few really big handfuls – fill the bowl, as you need a good base for all the tasty toppings you’ll add later. Speaking of toppings: I stuck with the classic croutons (homemade, of course) and parmesan cheese (vegetarian, of course). But I also got a little carried away with some of my own additions. 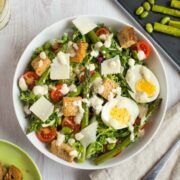 Cherry tomatoes, roasted edamame, roasted asparagus, and even a boiled egg. This vegetarian Caesar salad is full of protein, and there are enough tasty bits to keep you interested all the way through. And finally, the homemade Caesar dressing! 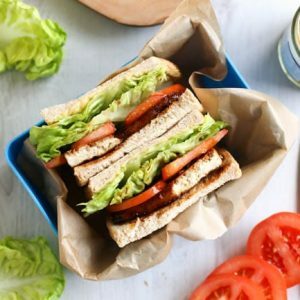 It was super easy to make – just a few simple ingredients thrown in my beloved mini food processor, and blitzed up. 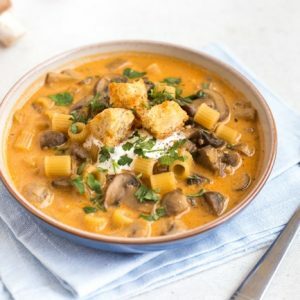 You can adjust the quantities depending on how tangy, how creamy, or how cheesy you want it to be. Just remember that when you taste it straight from the bowl it might taste a bit overly strong, but once it’s mixed through all that yummy Florette lettuce and all those heaps of toppings it will taste much more mellow. I will definitely be making this again! And there you have it – my ultimate vegetarian Caesar salad. What would you add to the top of yours? I’m thinking next time I might add some sweetcorn too, for another little pop of colour and flavour. Why not. To make the homemade Caesar dressing, add the small clove of garlic to a mini food processor, and add a few capers and the finely grated parmesan. Blitz until finely chopped. Add the Greek yogurt, extra virgin olive oil, white wine vinegar, dijon mustard, and plenty of black pepper, and blitz again until well combined. 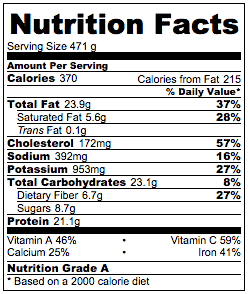 Taste, and adjust quantities as desired (remember it will taste overly strong and tangy straight from the bowl). Cut the slice of bread into 1 inch pieces, and toss in a little olive oil, along with the asparagus and edamame (I cooked mine straight from frozen, but fresh would work too). Lay everything out in a single layer on a baking tray, and season with salt and pepper. Roast at 190°C (Gas Mark 5 / 375°F) for around 20-25 minutes, tossing halfway, until the croutons are crispy and the vegetables are soft. Cook the eggs in boiling water for around 8-9 minutes, or until cooked to your liking. Drain, rinse with cold water, and set aside to cool, then peel and cut in half. To assemble the vegetarian Caesar salad, fill two large dinner bowls with mixed lettuce leaves. 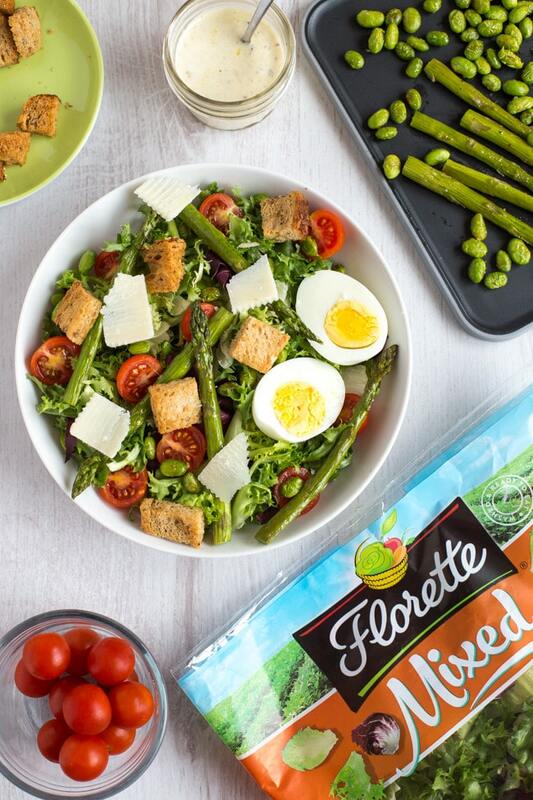 Top with the halved cherry tomatoes, croutons, roasted edamame and asparagus, and a few shavings of parmesan. 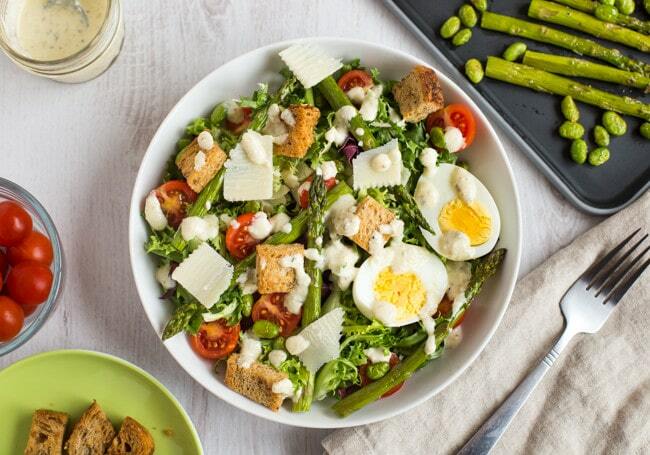 Finish with the boiled eggs and Caesar dressing, and serve immediately. Did you buy a jar of capers just to make your own homemade Caesar dressing? Spaghetti alla puttanesca is a great way to use them up! You say the ultimate ‘vegetarian’ salad and you put up the pictures containing egg? Although the way you described it was good. You don’t need to say “vegetarian parmesan-style cheese” all cheese is vegetarian. Vegetarians eat dairy vegans don’t. Actually not all cheese is vegetarian. Parmesan is made with rennet, which comes from the lining of a cow’s stomach. So it’s not the dairy that makes parmesan non-vegetarian, it’s the rennet. 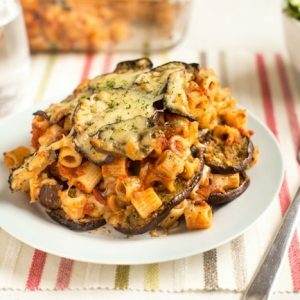 Most other cheeses are indeed vegetarian but you need to use a vegetarian parmesan-style cheese instead of real parmesan. This dressing is delightful — tasty and easy. 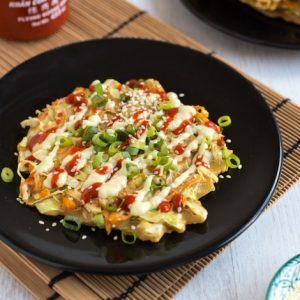 The evo + mayo combination really works making it just the right creamy texture. 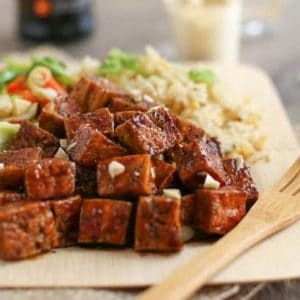 If you love capers, google the Seitan Picata recipe from Candle 79. It’s just delicious. Thanks Celesta, glad you like it! Yes, salad is rabbit food. For me it makes all the difference in what you put with it. 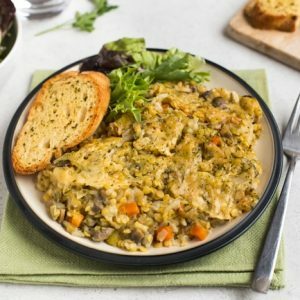 Protein is an absolute must and the dressing is keen, which is why you pulled it off in this case! Oh I hadn’t realised it even had anchovy in it (not that this is a problem for me) but your version looks really tasty. Yes it’s surprising how many things are unexpectedly non-veggie! I love Caesar salad, even with the anchovies, but since I often cook for vegetarians its good to know there is an alternative way of cooking it. Bravo! 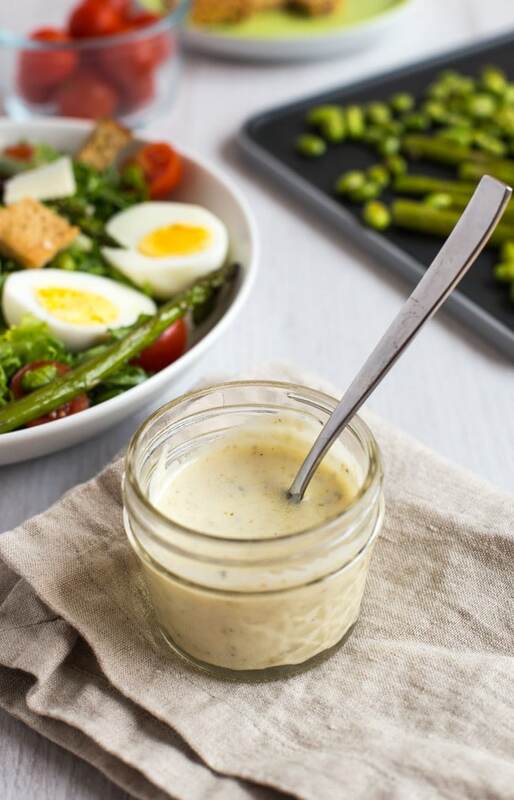 The Caesar dressing has sooo much flavour even without the anchovies – it’s so good! I guess it’s my own spin :) To be honest the name is irrelevant when it tastes this good! That’s my kind of salad! Could totally go with subbing hard boiled eggs for chicken. I love this vegetarian Caesar salad! I’d rather have the eggs cooked, atop then raw in the dressing. I also like how you dressed it up with extra goodies! Thank you. It’s one of my favorite salads and I will eat it vegetarian, seafood or in the classic way with chicken. Lovely colors! This is one of my favourite salads, as it has a little bit of everything. I love the creaminess and crunch from the croutons. That salad looks gorgeous! I love a good caesar salad, I think this vegetarian version could rival the original! Those salad bags are so handy aren’t they! 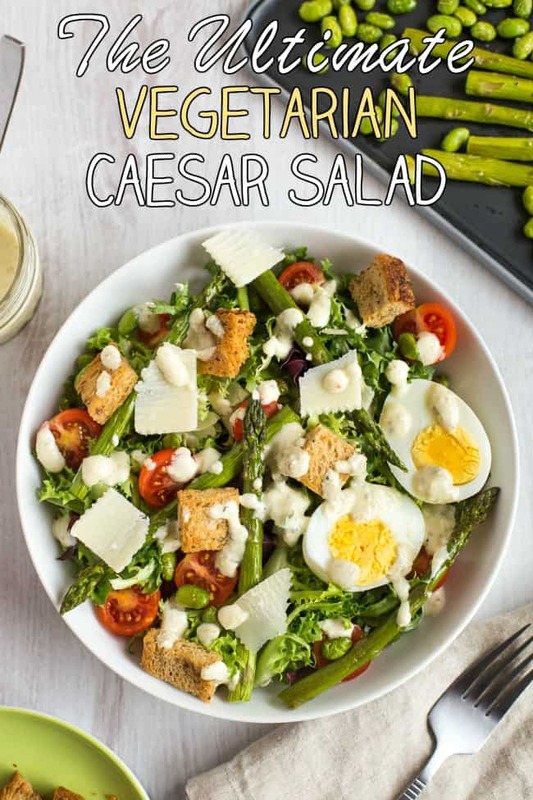 Lovely recipe, Ceaser salad is one of my favourites. 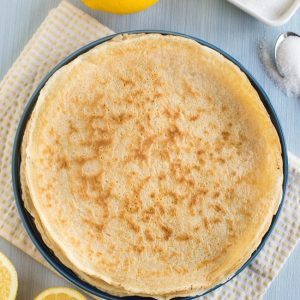 Love the recipe and the combination of ingredients used! Asparagus and eggs go so well together..
To be honest I never used to like boiled eggs at all, but I really enjoyed it in this! Mmm… I love Caesar salad too and your dressing looks super easy.